Things don’t always go as planned. Life comes at you sideways sometimes and knocks the wind right out of your sails. You can go from smooth sailing to rough waters in the blink of an eye. Have you ever been through a tough time that you are now thankful for? I know I have had my share of difficult circumstances, but God has been so faithful to see me through! I can look back with a grateful heart on things that I never would have chosen, but God in His infinite wisdom allowed me to endure. Pain and suffering are not something that we would necessarily want for ourselves but sometimes it is the vehicle that God uses to sanctify us. No one knows this better than Neuropsychologist Dr. Michelle Bengtson. As a Doctor and a Christian, she shares her journey through depression from her perspective in her new book, Hope Prevails. Michelle writes about what worked for her and what can help you if you are battling depression. Michelle wants you to know that you are not alone. She wrote this book to offer you hope and to dispel some of the myths and lies about this condition. Michelle’s approach treats depression physically, emotionally and most importantly spiritually, treating the whole person. Traditional treatment doesn’t address the spiritual side. Dr. Bengtson does a great job of addressing the spiritual side of depression throughout Hope Prevails. She addresses what depression is, where it comes from, and ways to treat it, but most importantly she addresses what depression does to a person spiritually and how that perpetuates depression. Each chapter in Hope Prevails: Insights from a Doctor’s Personal Journey through Depression is filled with truth and biblical wisdom along with practical steps to take. At the end of each chapter, she gives you a prescription, Your Rx, these thought-provoking questions and action items are steps that you can take to help you find healing. She also includes a recommended playlist of praise and worship music to uplift you and concludes each chapter with a special prayer. In the valley of my depression, the enemy tried to convince me that no one cared, not even God. For a while he had me convinced, and I took my pain and anger out on God. Can I share with you a little something I learned, though? God is big enough to handle my anger and yours. One evening the pain of the darkness dragged me so low that I wondered aloud where God was in my suffering. Did he even care that I felt like a surfer battered against the rocks within a vast, lonely ocean? In my agony and desperation, my wonderings turned to angry venting. I told God of the pain deep within my soul. I held nothing back as I lost control in an angry outburst like a volcanic eruption. When I had no more words to say and was physically spent from my vulnerable expression of the depths of my pain, I sensed a quiet gentle voice whisper within me, “Well, at least you’re now talking to me.” It wasn’t a condemning correction but more a lighthearted reflection to help me see the truth in my ways. Dr. Michelle Bengtson is a board certified clinical neuropsychologist with more than 20 years of experience in the diagnosis and treatment of medical and mental disorders in children, adults, and seniors. She has been in private practice for more than a decade of that time. Speaker, author, and doctor, Michelle is also a woman—a wife, mother, and friend. She has experienced her share of trouble and trials and knows the pain of losing someone she loves as well as the despair that can follow trauma or illness. Combining her professional expertise and personal experience with her faith, Dr. Bengtson is on a mission to instill hope in the hearts of those who are suffering from or caring for those with ADD/ADHD, learning disabilities, developmental disorders, head injuries, dementia, and the neurological side effects of illnesses such as Epilepsy, Diabetes, Fibromyalgia, Lupus, and Cancer, as well as psychiatric disorders such as Depression, Anxiety, and Bipolar Disorder. Everyone goes through hard times, but you are not alone. Hope is the key to the survival of your soul. Dr. Michelle Bengtson provides sound practical tools, affirms worth, and encourages faith. She instills hope to unlock joy and relief—even in the middle of the storm. I highly recommend Hope Prevails for anyone struggling with depression, or if you have a family member or friend who suffers from this condition. Visit Dr. Michelle Bengtson’s blog where she offers a free book on how to help a loved one with depression. A Special thank you to Dr. Michelle Bengtson, The Blog About Network, The Blythe Daniel Agency, and Revell for providing me with a signed copy of Hope Prevails for me to review and giveaway along with the goodies above! Leave a comment about a tough time that you have been through and are now thankful for in the comment section below and share this post on social media with the hashtag #HopePrevails for a chance to win a signed copy of Hope Prevails, along with this beautiful scarf, hope bracelet, and dog tag all reminders that hope prevails!! I know so many friends struggling with depression – this looks like a good read even to gain insight and compassion for those suffering. Definitely adding it to my reading list! So excited to see that you are featuring Michelle’s book! I really enjoyed it — and was inspired by her story. Reading this book pulled me out of the pit I really didn’t even know that I was in. Widowhood caught me by surprise. Of all the books that I read trying to get through to an understanding of my life, this was the most helpful. Constantly recommend it to others. Have given away numerous copies. Would love another copy to share. Congratulations!! You are the lucky winner of the Hope Prevails package! Please send your address to info@MistyPhillip.com so I can drop it in the email to you. Having an incarcerated loved one can be challenging in so many ways. Seeing the work that the Lord is doing in him and thru him however is incredible. ? PTL!! In Jesus there is freedom! It’s nice to meet you, Misty! 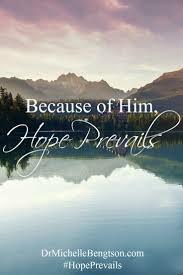 I read Hope Prevails and I absolutely loved it :).